Purple Stitches is an independent fabric shop run by Howon and Viv, a husband and wife team. Launched online in 2012, it originally started as a side business to Viv’s handmade business but it has since taken over. We specialise in modern and quirky quilting cottons from fabric companies such as Dashwood Studio, Cotton + Steel, Art Gallery Fabrics, Robert Kaufman and many more. We also have a selection of Japanese fabrics, certified organic cotton from Cloud9 and Robert Kaufman and dressmaking lawns and knits. 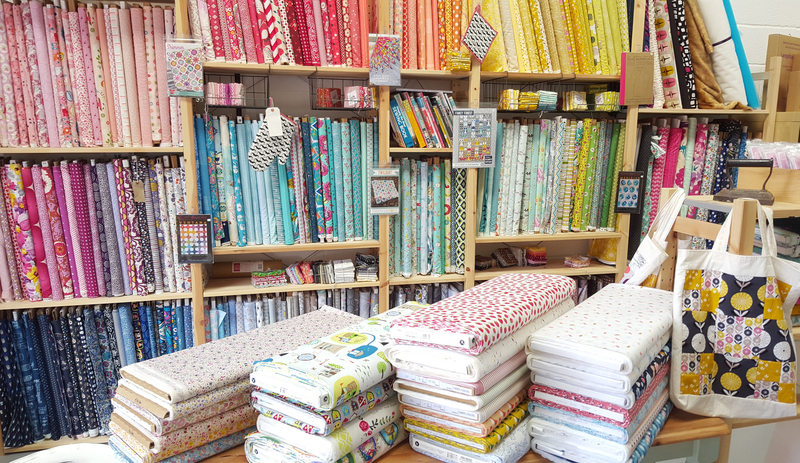 We stock a variety of quality haberdashery, lace, ribbons and trims as well as dressmaking patterns from independent designers such as Colette patterns, Sewaholic, Blue Ginger Doll, Made by Rae and many others. Our shop address is Unit 14, Hassocks Wood Business Centre, Stroudley Road, Basingstoke, Hampshire, RG24 8UQ and our opening hours are Tuesday to Wednesday 10am to 2pm and Thursday to Saturday 10am to 4pm.